Welcome to Team.Live, scheduling and communications created specifically for the hospitality industry. Team.Live streamlines the scheduling process, makes it easier to submit requests and allows teams to communicate more efficiently. After receiving an invite to join from your employer, you can access Team.Live by visiting “Team dot Live” on your browser or via the TeamLive mobile app which is a free download. When you sign into TeamLive, you’re taken directly to your schedule. ou can switch your view from here to show your personal schedule by choosing the top bar. Sort by positions or person. You can click on the dates to see a future or past schedule. You can also select if you would like to have a day or week view. To access communications with your team click on the blue chat bubble on the bottom left of your screen. This will bring you to the news feed. If you’d prefer to chat one-on-one with a co-worker, go to Messages located on the top right corner. Some examples of what you can do with instant messaging includes request time or ask a fellow co-worker to cover for you. Select Messages to start a message. Select the employee you would like to send a message to. Type the message in the text box. Press the paper airplane in blue on the bottom right to send the message. To request a shift swap with another coworker, navigate to Shift Offer and click it. Depending on the settings your manager has in place, your request will either be automatically approved, or sent to your manager for review. Once they have decided whether to approve or deny your request, you will receive a notification. 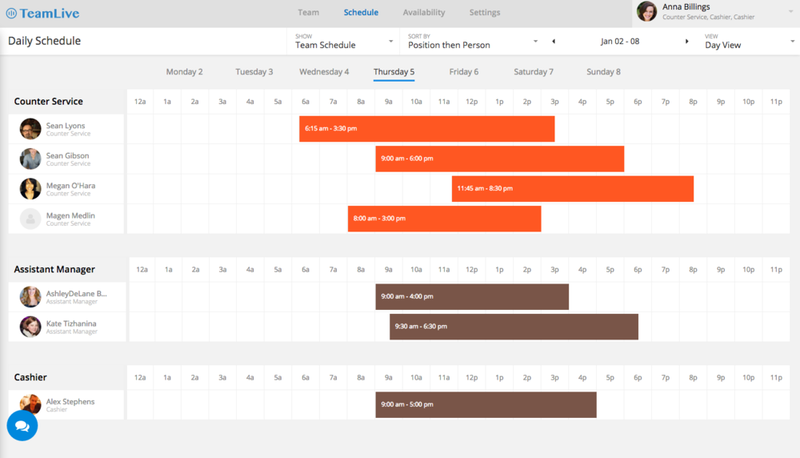 You can offer your schedule to a specific team member or offer it to the entire team. Supply a reason and select who you would like to offer the shift to. You can manage your time off requests in the Time off tab. This is how your managers will approve your time off. The Availability tab allows you to set the days and times you are available to work. This makes scheduling easier in the case that you go to school, have another job or have other responsibilities you need to take care of. When in the availability tab, select new request. Make sure you select the starting date of this request and then how often this request is to repeat from the drop down. Once you have entered this information you can drag and drop on the time table below to fill in your time slots. it the green submit button on the top right corner and then your manager will be alerted with the reason. You can see all your team members in the Team tab, by clicking on Team. If you would like to update the information on your employee card you can do this under the Settings tab. Any time a schedule is changed, you will receive a notification. No more surprises or confusion. TeamLive makes accessing your work schedule, communication with your team and making time off requests easier and more efficient than ever before. #1: "What does your company do/specialize in?" It is expected that you do research on the company before the interview. The hiring manager should not be the one to inform you. Not knowing general information about business makes you seem unprepared and unfit for the job. If you are unsure, you can ask for clarification, but do know the basics, such as the type of restaurant it is or what type of cuisine it serves. #2: "Um... I don't know." You may be stumped by your interviewer's questions, but there is a better way to go around it. Try to avoid saying, "I don't know", and respond with, "That's a good question." That reply can help you segue the conversation or redirect it towards a topic you are able to answer. However, be sure to stay relatively relevant and don't go totally off topic. #3: "My last boss/job was terrible." Talking negatively about your former employer or workplace is not a good idea. Your complaining makes it look as if you are hard to work with and not a team player. Instead, mention how you able to take away positive experiences and learnings from your previous position. #4: "You can find that on my resume." Certainly, the hiring manager knows that, and just wants you to elaborate further. He/she most likely wants you to tell them more about your role that you did not have written down. Also, he/she could be assessing how well you are at communicating and testing your social skills. Basically, use this chance to highlight your skills in a greater way, rather than it being something listed on a piece of paper. #5: "No, I don't have any questions." Don't leave the job interview on a flat note. Ask your recruiter a thought-provoking question, because it can possibly help your memorability-factor. Prepare, in advance, a few you can perhaps ask, such as "Do you have any hesitations about my qualifications?" or "What do you think are the most important qualities for someone to excel in this role?"